A brighter smile can be yours! Are your teeth stained? At home whitening just isn’t giving you the results you want? We’ve got you covered. In just one visit, you can experience Zoom WhiteSpeed’s high-powered whitening. Sit back and relax, and we’ll whiten your teeth in just hours. Clinically proven to whiten up to 8 shades in 1 hour, you’ll leave feeling refreshed and bright, just like your shiny pearls. We’ll cover your gums and lips and then apply the low-heat light and gel on your teeth. In three to four 15-minute cycles, this light and gel will remove deep stains. We’ll even give you the trays so you can touch up your teeth at home as needed. 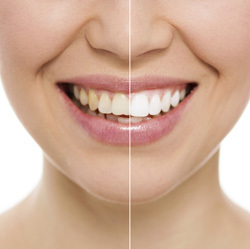 Choosing to visit us for whiter teeth is a pain free, safe way to brighten your smile! While everyone responds differently to whitening, tooth sensitivity may occur. Just like with any whitening product, we have suggestions to limit this as much as possible.